Cabinet scrapers are a familar and much used item in cabinetry and fine woodworking, but these usually comprise rectangular or French curve forms. What happens when one needs a little more finesse or there is a job that requires fine attention to detail where hand sanding may blur detail? Well, those inventive chappies at Flexcut have come up with a set of cabinet scrapers which will, I am sure, be a delight for carvers and cabinet makers/restorers everywhere. The SK120 has six blades in total and the ends are all shaped differently. They are made from spring steel and they all sport a universal shaped tang which slots snugly into one of two handle options. There is a small palm-sized handle available and a larger handle when one needs to use a little more 'oomph'. I actually preferred the larger handle as it gave me a few more options in holding the tool and thereby a little more control. The edges are sharpened by ticketing edge with a burnisher to form a hook, or for a slightly more delicate edge, a diamond hone. 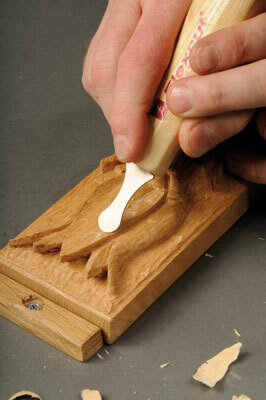 Whichever option you choose, the tools are incredibly easy to use and leave a very fine finish on the work. This leaves the question - does one need to sand the work after using these? "The tools are incredibly easy to use and leave a very fine finish on the work"